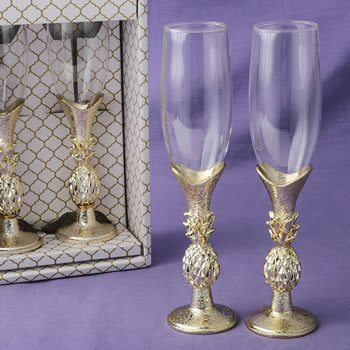 Raise a toast with friends and family with our magnificent golden pineapple themed flutes. Perfect to offer a warm welcome at any grand occasion! This elegant set of two glasses feature a classic flute shape with a slender clear glass bowl on top and a long stem. The stems are made from poly resin. Each flute has an 8oz capacity. The stems are decorated with a molded pineapple design and have a stunning shiny gold textured finish. This set of two flutes is beautifully presented in a white bottom box with a stunning gold Hampton Link design and a clear window display plastic top.